WOW!! Another week has flown by. I realize now I had a card that didn`t post as scheduled so I`ll be adding that to my blog later on today. I've had this image from Stamping Bella for a couple of months now and I'm finally putting it to good use for this week's sketch challenge. 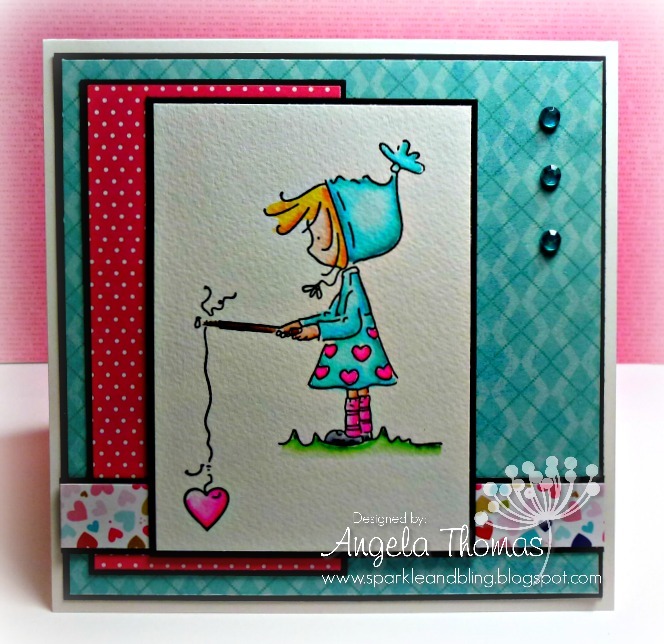 The image I have used is called "Ramona Fishing" I've stamped her in Versafine Onyx Black, embossed with clear embossing powder and then watercolored with Tombow markers. The DP is a mix of Bella Blvd, MME and Pink Paislee. I don't discriminate with my DP, it likes to play with each other. LOL!!! Email your entries to Emily at Stamping Bella by the end of Thursday February 14th to be in with a chance of winning some Bella Bucks.